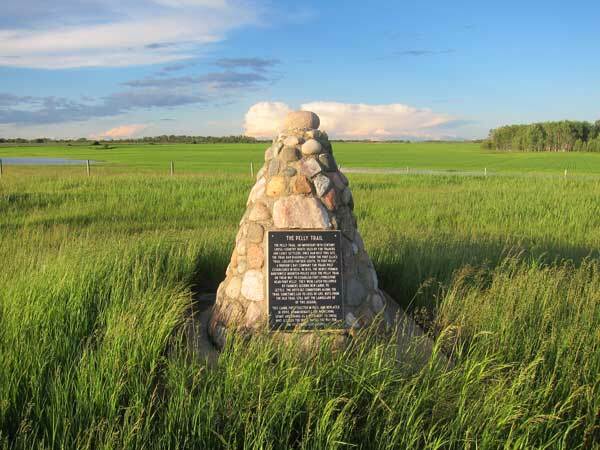 This monument in the Rural Municipality of Shell River, erected originally in 1963 and replaced in 2006, commemorates the Pelly Trail, an important 19th-century cross-country route used by fur traders and early settlers that ran past this site. The trail ran diagonally from the Fort Ellice Trail, located further south, to Fort Pelly, a Hudson’s Bay Company post established in 1824. In 1874, the newly formed North West Mounted Police used the Pelly Trail on their way to establish Fort Livingstone near Fort Pelly. They were later followed by farmers seeking new lands to settle. The difficult conditions along the trail sometimes led to loss of life. Ruts from the old trail still dot the landscape of this region.